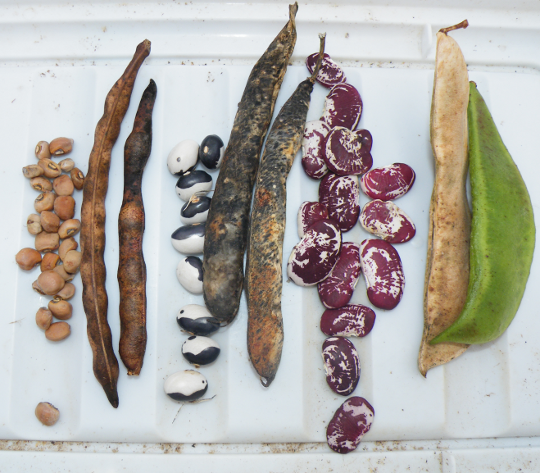 I set out to plant five different types of beans in the garden this year, after having a successfull year with Ying Yang beans in 2010. I’ve also been trying to mix up what crops are planted in which portion of the garden, so I wound up with two patches of beans. In hind sight this two patch system might be one of my best ideas, since one patch of beans have been chewed up by deer, and since then overgrown with weeds. The other patch seemed to be overlooked by the grazing deer, and grew quite well. Since the plants were growing well, I weeded them and watched them grow. My plan this whole year was one of expansion, a year when I’m basically growing seeds for future gardens. You see, a pack of 20 seeds can run up and over $3, and tends to leave me with about a cup of usable beans. That’s a great return, but not nearly enough for a guy whole eats chilli at least once a week. In order to grow the quantities that I’m hopping to graze upon in future winters I will need lots of seeds, and the only way to do that cheaply is to grow my own supply. 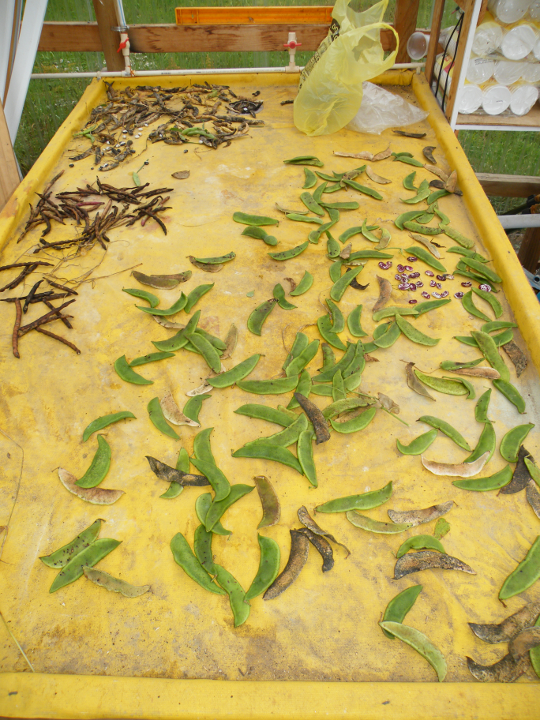 I picked the beans shown while the rain gently fell, and once I had several small bags full of water soaked bean pods, I had to dry them out. (Wet, even moist beans will grow mold). I took a gamble on drying the beans in the greenhouse since it’s generally dry and warm this time of year. I’m quite happy with the harvest, even though I’ve only grown three varieties rather then five. I took a picture of the beans next to their pods so that you could see when the pods are “ripe” to have the beans removed. I’ve found it’s easiest to shell them when the pod turns a dark brownish black. The green pod shown to the right still needs some time to dry. Once out of the pods, I store the beans in open topped cups for a few weeks stirring them around daily. This helps them air out and loose excess moisture. After a few weeks i’ll move the beans from the open top container to a glass canning jar for winter storage. In the spring, those seeds will be ready to plant after the last frost (about June 1st in NW PA).